Everyone wants more room. Building an addition or bump-out is the classic way to make more interior space. But taking on a six-figure project may not be in everyone's budget. That's why many homeowners look inward–and upward–for more room. Attics are a prime opportunity for expansion. The space is already enclosed. No foundations have to be poured. Electricity is nearby and can be tapped into. Unlike basement additions, floor moisture is not a problem. In short, attics may be the place to go when you want more space. Begin with Code: Building code positively rules attic remodels. From minimal floor space to ceiling height, a host of regulations will guide your remodel. Rafters vs. Trusses: Rafters, mainly found in older homes, lend themselves to attic expansion. Rafters look like giant triangles that form the peak of your home's roof. Trusses look like large triangles composed of smaller triangles. They make attic remodeling impossible unless they are replaced. Get In Shape: If triangular houses such as A-frames were functional, they would be more popular. Instead, sharp angles make storage and living difficult. Building knee walls–short vertical walls about 3' tall–is one way to help fix this. Flooring: Unless expressly built for use as a living space, your attic floor may not be strong enough. All attics' joists can carry a minimal dead load weight (i.e., 10 pounds per square foot). But live loads are a different matter. Often, minimal live load requirements are four times that of dead loads. Insulation: If your attic already has insulation, it is probably useless for your intended attic remodel. The reason? Because that insulation is below your feet, between the joists. Today's attic remodels increasingly are getting foam insulation sprayed between the rafters before installation of drywall. Ree Drummond's girls needed a place of their own (read: away from their brothers), and what better place than in that aerie called the attic? Bob and Cortney Novogratz transformed their orange-carpeted storage room that was "cloaked in abject purposelessness," as Ree puts it, into a cozy cottage that is both feminine and functional. 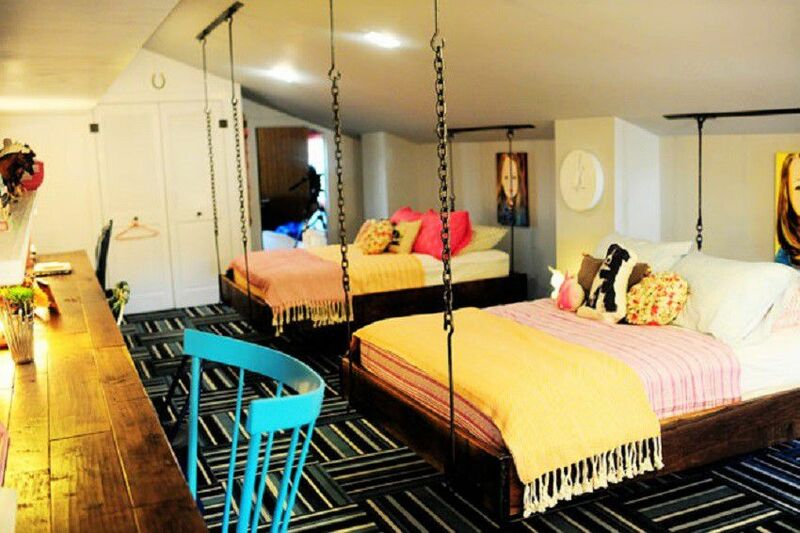 Angle iron bolted-to-ceiling rafters provide support for the chains holding up the "levitating" beds. Use reclaimed wood to build a charming desk. 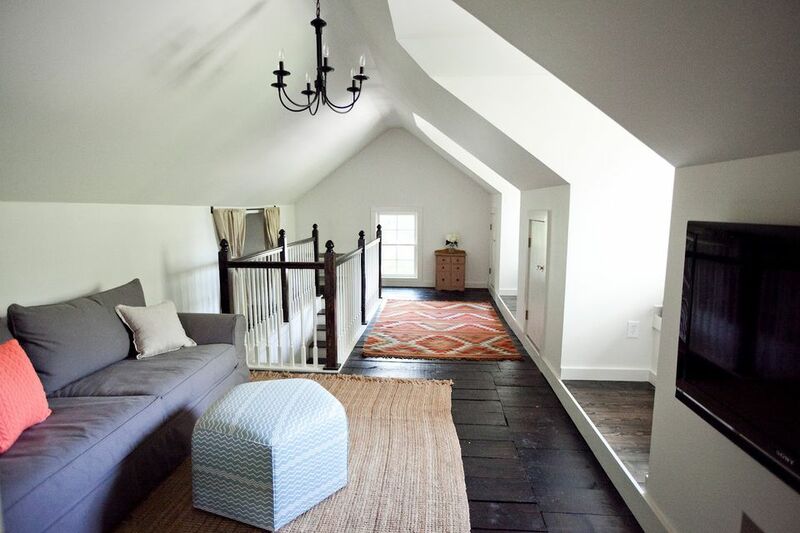 Before owners Clarita and Ben began remodeling their attic, they knew they wanted it to be a bedroom/office combination space. They added collar ties above head level and stained the wood dark, a bold contrast to the stark white of the walls and flooring. More than anything, though, they wanted to maintain a clean and white minimalist Scandinavian look that would make their attic bedroom a delightful, welcoming place. In the end, they loved their new space so much that they shifted bedrooms: the parents moved to the attic and children moved to the former master suite! Katie O'Hagan's Beacon, NY attic, intended for her two daughters, was a dark, depressing place. She knew she could do better, so she used a rotary hand sander to transform the floors from gloomy to glistening (she says she would never do that again; instead, she recommends renting a floor sander). The most important improvement, though, was painting the walls light-reflective greens, yellows and oranges. For a final, bubbly touch, O'Hagan, an accomplished fine artist, painted cheerful polka dots on the attic's end walls. The Natos were tired of farming out their house guests to relatives' houses, so they decided to turn their "gross, dark, barn-ish" attic into a light-filled, clean living space. To avoid wasting precious space, they designed various nooks and private spaces, such as a cozy window seat. Brittany Bailey over at Pretty Handy Girl hated her ugly attic but loved the idea of reclaiming scrap wood that she had laying around. Disused painted wood as well as pallet boards now form an eye-dazzling accent wall at one end of her spiffed up remodeled attic. Megan Bray wanted her young son Quinn to have a colorful, lively attic bedroom, so she undertook a remodel that transformed this dull area into a fun zone. For the walls, she color-matched Behr eggshell sheen to Dutch Boy Nantucket Mist, while furniture received durable, high gloss Behr matched to Dutch Boy Sheet Metal. Painting a chevron pattern on the walls gave the attic a buoyant, electric air. For a sports-loving boy, nothing could be better than pennants on the wall and a bedspread in favorite team colors. To top things off, sports mascot Bucky Badger–custom made by Mom with a computer printer and four 8.5 x 11 sheets of paper–presides over the bedroom. A white minimalistic palette may seem all wrong for attics. Cobwebs and darkness do not lend themselves well to light colors and to clean lines and planes. But Clarita, a self-confessed lover of "Swedish and Norwegian homes of much white space, and therefore minimalistic décor" was determined to make it work, and did she ever. She and husband Ben brought the attic of their 100-year-old Southern cottage out of the Dark Ages and into modern times by adding windows and ample artificial lighting. Yet they also retained winning elements of the original attic by leaving the brick fireplace exposed. Too often, flooring is an afterthought in attic remodels. Finishing the walls and adding skylights is so laborious and cost-intensive, flooring takes a back seat. The owners of this Maplewood, NJ home sacrificed nothing when it came time to floor the attic. Buttery yellow wide plank flooring captures and reflects the ample light that streams from the added floor-to-ceiling windows. Ecos, a home renovation company based in Trim, Ireland, near Dublin, turns out wildly innovative attic conversions. Most conversions seek to blur the triangles inherent in attics. Ecos took the opposite approach, emphasizing the triangles and infusing the space with an upward thrust. Install multiple skylights in a row, one per pair of rafters. Build a wall of drywall at the end of the house and inset a custom-built triangular shelving unit. The killer features of this attic conversion are the clever space-maximizing built-ins designed and constructed by William Farnsworth of Boston-area Custom Contracting, Inc. Knee walls have drawers, cabinets, and shelves built into them to utilize every possible square inch of space for this children's bedroom. Build a knee wall to cover up the triangular space where the rafters meet the top plates of the exterior walls. Hack an IKEA furniture item–dresser, shelves, storage unit–and build it into the knee wall. Can You Install Tile With Thinset on Concrete Floor That Has Mastic? How Can I Get Rid of Excess Condensation in My Basement? Is Free Home Insulation Legitimate, Scam, or a Little of Both?